Policy makers are setting ambitious goals for student achievement that depend heavily on the work of teachers in and outside the classroom. favor of more powerful opportunities (Stein, Smith, & Silver, 1999). (Blank, de las Alas, & Smith, 2007; Wenglinsky, 2000). Teachers’ professional development should be refocused on the building of learning communities. To revolutionize education and achieve learning goals for students, teachers require a great deal of learning, support and guidance ( Ball & Cohen, 1999; Putanm & Borko, 1997). “Teaching at Risk: A Call to Action” – a report released by The Teaching Commission( 2004) reminds us of the important role played by the teachers and calls for provision of “ongoing and target professional development” to help teachers meet the new demands. necessary to teach the curriculum. Professional development is more effective when schools approach it not in isolation (as in the traditional one-shot workshop) but rather as a coherent part of a school reform effort. Research on effective professional development also highlights the importance of collaborative and collegial learning environments that help develop communities of practice able to promote school change beyond individual classrooms (Darling- Hammond & McLaughlin, 1995; Hord, 1997; Knapp, 2003; Louis, Marks, & Kruse, 1996; Perez et al., 2007). McLaughlin and Talbert (2006) have been studying school-based learning communities for more than 15 years. Their seminal work has taught us that school-based communities are uniquely situated between “macro-” or system-level directives and resources and the “micro”realities of teachers’ classrooms. 2001; Supovitz et al., 2000). sustained and intensive professional development was related to student achievement. We are coming to understand that learning rather than being solely individual (as we have taken it to be) is actually also social. It happens through experience and practice. In plain terms—people learn from and with others in particular ways. They learn through practice (learning as doing), through meaning (learning as intentional), through community (learning as participating and being with others), and through identity (learning as changing who we are). Boroko, Whitcomb and Liston(2009) described the use of technology in teacher learning as “wicked problem” suggesting that it is a really difficult problem that cannot be resolved by one size fits all solutions. Brown and Adler(2008) argued that we must pay attention to social learning as a new model learning rather than traditional knowledge transfer from teacher to students. They believe that we should move to learning 2.0( just as we moved to Web 2.0) which is a demand-pull learning that removes the fine line between formal and informal learning. Today’s teachers are asked to teach 21st century skills to students and thus need to take on new skills and concepts. Teachers must be life long learners who are adaptive and continuously growing and developing new skills throughout their career( Darling-Hammond & Bransford, 2005). Abundance of computers and digital media in schools and emphasis place on technology integration highlight the importance of teacher learning and professional development that support new modes of learning( Whitehouse, 2011). Constructionism- theory combining earlier theories such as Piaget’s constructivism and Vygotsky’s situated learning. How people learn ( Bransford, Brown, & Cocking, 2002). Situated learning( Glazer, Hannafin, Polly, & Rich, 2009). Whitehouse(2011) suggested teacher learning for technology integration can be done by using “Learning by Design” similar to the more familiar project-based or inquiry-based learning. In constructionism, given design project drives the technology use, and technology skills are learned in an integrated way, along with the domain of the creative activity. This way technology serves as a means to lead to a deeper more transferable acquisition of knowledge. Constructionism incorporates elements of the social cognitive theory of Vygotsky, thus social and cultural interaction is vital in knowledge construction and learning. Some researchers argue that teacher learning is best supported using Lave and Wenger’s(1991) situated learning theory and by formation of communities of practice( Wenger, 1998). Whitehouse(2011) and Kafai & Resnick(1996) argued that both the process and the product are important for developing technology professional development research agenda and for developing effective teacher learning contexts. “Blurred” learning environments created by networked learning contexts where learners are often working sychronosly across distance and at the same time working face-to-face with a group. Thus the meaning of being “present” blurs as one works across time and distance. Teachers may use computers as “partners”( p. 4) in cognition because computers can perform certain functions more quickly and accurately than humans( Salomon, Perkins and Globerson, 1991). According to Bransford, Brown and Cocking(2002) new findings on students learning also apply to how adults learning. Eg: metacognitive reflection( Hammerness et. al, 2005). Whitehouse(2011) recommended four dimension of teacher learning by combining the Dimensions of Effective Learning (DEL) developed by Bransford, Brown and Cocking(2002) and teacher professional development research literature. The four dimensions named as ” Teacher Dimensions of Effective Learning- TDEL” intersect with learners, pedagogy and technology drawn from the work of Borko(2004). The three variables crossed with TDEL create an analytical for framing teacher professional development. visits to one another’s classrooms and provide feedback and assistance (Hord, 1997). effectiveness (Lustick & Sykes, 2006; Sato, Wei, & Darling-Hammond, 2008). I read a blog post by Larry Cuban talking about the hype of online learning especially at high school level and what drives the hype. He referred to the news coming from Stanford University where the Stanford Online High School graduated 30 seniors this year. What struck me was the explanation of the hype cycle and the causes. Many have commented on his post and as expected there are many who are not fully convinced on the promises of such technological innovation and radical changes to the teaching and learning. As a classroom teacher, I feel like taking the side of the teachers but as a technology enthusiast and learning sciences researchers I am somewhat convinced that technology can make a difference and teachers need to learn to live with it. That being said, I agree that teachers will and should play a vital role in the learning experiences of high school children regardless of the medium( virtual or in a physical classroom). Effective teachers should and would be able to teach with or without technology. Teachers views on factors affecting effective integration of IT in the classroom. It’s been a while since I last documented my readings and research on this blog, not because I didn’t read, but because I was not able to sit down to write a post. Over the past few weeks, I read several articles and a few chapters from Cambridge Handbook of Learning Sciences. I have several excerpts that I would like to document here and I wish to do that over the next couple of days. At work, this is a difficult time as I am developing two new courses, Java Programming( intro level) and Flash Programming ( Intro level) for seniors at King’s. In addition to developing new curriculum for these courses, I am also trying create a setup for the computer science classroom and obtain software licenses such as Adobe CS5 for class use. Thus far, this has been a challenging task, in terms of convincing the administrators and negotiates with the IT department to facilitate the process. Yesterday, I read an interesting article from the Journal of Technology and Teacher Education on “ teachers’ views on factors affecting effective integration of information technology in the classroom” by two Israeli researchers. This article reports on an exploratory, longitudinal study which examined six teachers of grades 4, 5 and 6 for three years. Based on the individual case studies of four teachers and the case study of the entire group, the researchers found two patterns of views on the factors affecting technology integration: views concerned with the sources of influence or “human factor”and: the nature of influence when using technology ranging from technical to cognitive transformations. Levin, T., & Wadmany, R. (2008). Teachers ’ Views on Factors Affecting Effective Integration of Information Technology in the Classroom : Developmental Scenery. Journal of Technology and Teacher Education, 16(2), 233-263. 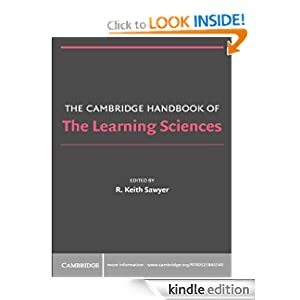 I just bought the Cambridge Handbook of Learning Sciences [Kindle Edition]. What a good resource for me to prepare for my comps! I will be writing on the different topics covered in the handbook soon. Over the years, there has been numerous calls for the reform of teacher professional development (Darling-Hammond, 1997; Darling-Hammond & McLaughlin, 1995; Hawley & Valli, 1999; Lewis, 2002; National Commission on Teaching and America’s Future, 2003; Wilson & Berne, 2001). The need for providing teachers with on-going high quality PD. “deficit model of knowledge” (Hawkes, 2000 p. 268). Adsit(2004) argues that professional development for teachers opportunities for “social collaborations”(Marx et al., 1998) among “robust” peer supported networks. Opportunities for collaboration and professional growth [Fusco, Gelbach, & Schlager, 2000; Schlager & Schank, 1997; Schlager et al., 2002].